Paper is precious to us and we hate to let anything go to waste, so when we set up a project to print, we will use scraps of paper or misprinted cards to test the color and impression. Once we get as far in the set up process as we can go using scraps, we'll use clean paper to proof before we start the print run. Sometimes the test prints can be really beautiful with strange mixes of color and type etc... 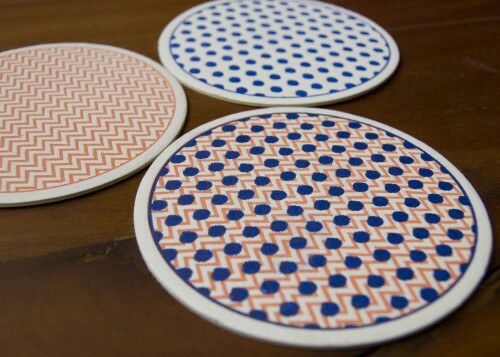 Here is a photo of a coaster created by testing two of the new graphic prints, one on top of the other. I would love a dress made out of this pattern!